When life gives you canker sores...make grass jelly. I'm finally reading A Game of Thrones, and it's proving to be a treat in more ways than one. Amid all the drama and action-packed lines, it's been fun to take note of what meals George R. R. Martin is cooking up for his characters. And, from the Game of Thrones food truck to the "unofficial" cookbook, to the official cookbook, I'm definitely not the only one who enjoys making this connection. "Wine no longer agrees with my digestion, I fear, but I can offer you a cup of iced milk, sweetened with honey. I find it most refreshing in this heat." "They ate suckling pig that night, and pigeon pie, and turnips soaking in butter, and afterward the cook had promised honeycombs." "Her supper was a simple meal of fruit and cheese and fry bread, with a jug of honeyed wine to wash it down." A cup of iced milk sweetened with honey sounds pretty scrumptious, this coming from a lactose-intolerant girl, mind you. People in Taiwan know how to deal with humidity. Summers there are incredibly hot — all the more reason to eat shaved ice and bowls upon bowls of cold grass jelly and chilled mung bean soup. It isn't getting hot in New York just yet, but in the past week, I've come down with a sore throat in addition to several canker sores. In Chinese medicine — and I'm probably butchering this — they say that certain foods are "cold" while others are "hot" (or "yin" and "yang," respectively). An excess of either leads to problems in the body. For instance, when you have canker sores/mouth ulcers, you're supposed to eat "cool" foods. Thankfully, grass jelly (仙草) and mung beans and two foods that fall into that category. I love it when good food just happens to serve as good therapy, too. In case you're not familiar with grass jelly, it's like Jello's Asian brother (or sister), but black, unsweetened, and in a can. It has a mild, herbal taste that I find really appealing. Preparation couldn't be easier. Just bust the can open, break it up into chunks with a spoon or knife, and mix it with some sugar. Or serve it Game of Thrones style, with honey. 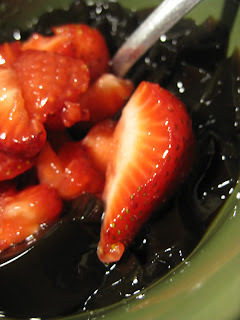 The other day, I mixed it with some sliced strawberries to arrive at a delicious red and black combination. Perhaps a suitable snack to eat while reading The Red and the Black? Oh, the possibilities.